Flamingos are a type of wading bird in the family Phoenicopteridae, the only bird family in the order Phoenicopteriformes. There are four flamingo species in the Americas and two species in the Old World. Flamingo comes from Portuguese or Spanish flamengo, “flame-colored”, in turn coming from Provençal flamenc from flama “flame” and Germanic-like suffix -ing, with a possible influence of words like Fleming. A similar etymology has the Latinate Greek term Phoenicopterus (from Greek: φοινικόπτερος phoinikopteros), literally “blood red-feathered”. Flamingos usually stand on one leg while the other is tucked beneath their body. The reason for this behaviour is not fully understood. One theory is that standing on one leg allows the birds to conserve more body heat, given that they spend a significant amount of time wading in cold water. However, the behaviour also takes place in warm water and is also observed in birds that do not typically stand in water. An alternative theory is that standing on one leg reduces the energy expenditure for producing muscular effort to stand and balance on one leg. 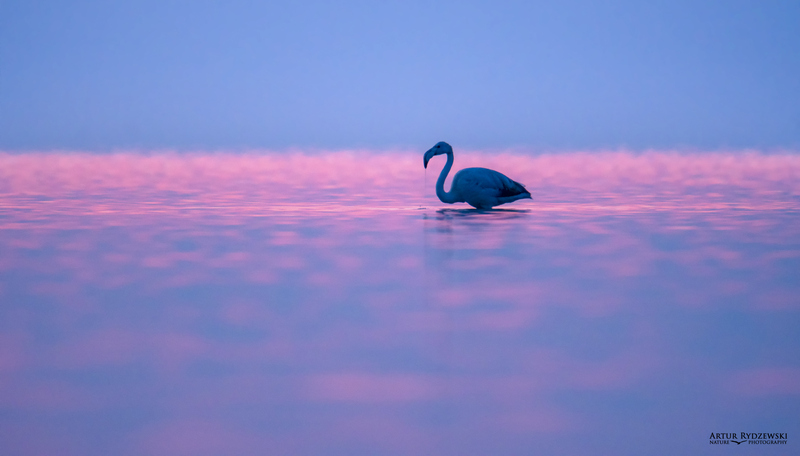 A study on cadavers showed that the one-legged pose could be held without any muscle activity, while living flamingos demonstrate substantially less body sway in a one-legged posture. As well as standing in the water, flamingos may stamp their webbed feet in the mud to stir up food from the bottom. Young flamingos hatch with greyish reddish plumage, but adults range from light pink to bright red due to aqueous bacteria and beta-Carotene obtained from their food supply. A well-fed, healthy flamingo is more vibrantly colored and thus a more desirable mate; a white or pale flamingo, however, is usually unhealthy or malnourished. Captive flamingos are a notable exception; they may turn a pale pink if they are not fed carotene at levels comparable to the wild.